The original emblem was designed during a 1933 Magpie contest. Martha Latz (33’) received first place and $2.00 for her design on the condition that some of Howard Hall’s (33’) features would be incorporated into her final design. Hall received second and $1.00 for his contributions. The emblem appeared on the 1933 Tattler cover. The official flag was selected in 1964 from more than 50 entries in a contest sponsored by the Student Council. 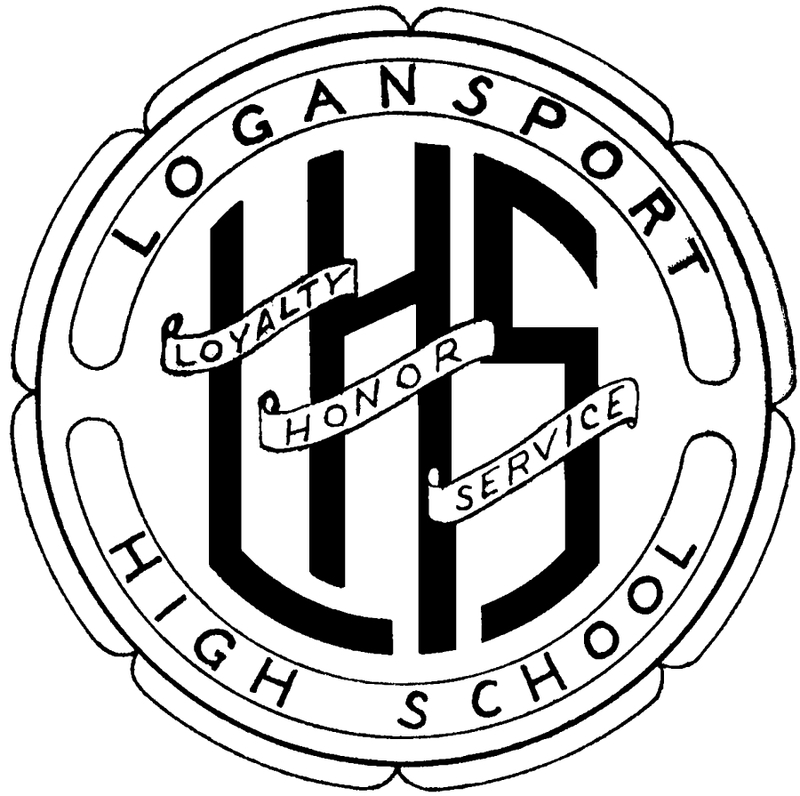 The flag’s designer, 1964 graduate Russ Bridenbaugh, created a flag with the school seal on the left lying on a white triangular field pointing to the right. 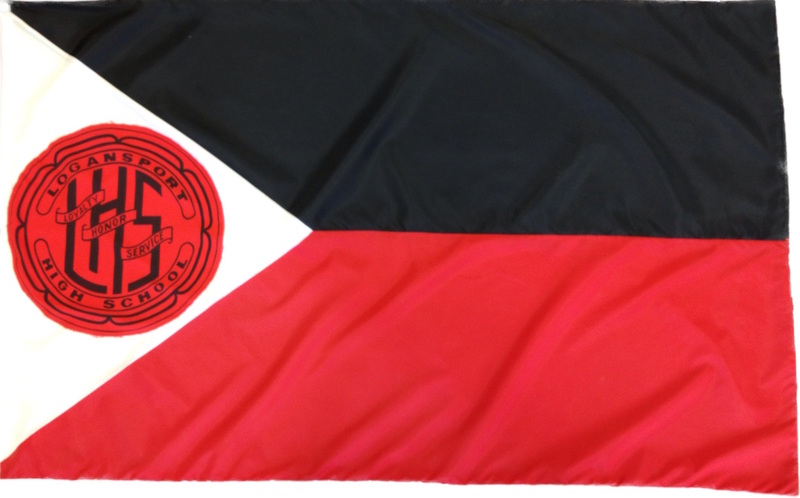 The upper portion of the remainder of the flag is black and the lower portion is red. “The flag is simple but has a certain elegance about it, and I believe conveys exactly what it should say… ‘This is our motto and these are our colors,” said Bridenbaugh, who went on to earn a B.S. degree from Ball State University and a J.D. degree from Indiana University. 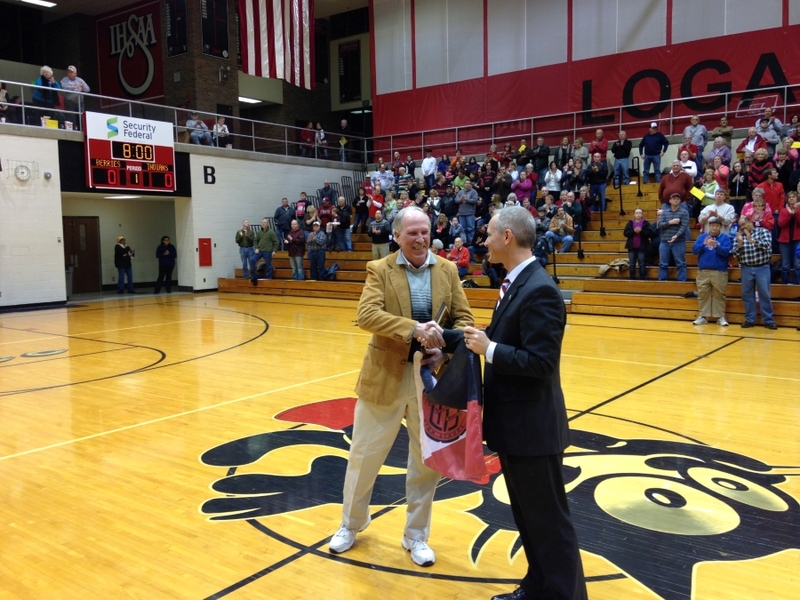 Russ was honored on January 31, 2014 at a home girls basketball game. Thank you Russ for your outstanding contribution to our school and the legacy of its tradition. Here is the Origin of the Abraham Lincoln Statue in LHS that dates back to 1923. When we strolled the halls or entered the auditorium at LHS, we passed the statue of Abraham Lincoln. Did any of us know how that statue came to be there or that it was the dream of the 1923 history classes of Professor Willis Richardson? The 1923 Tattler carried a story about the presentation on March 19, 1923 of the Lincoln statue to the high school. 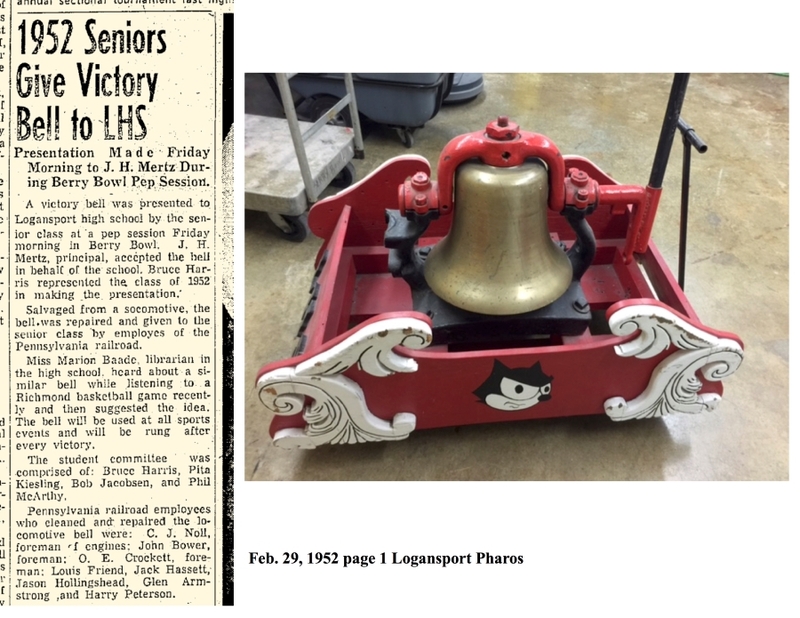 Stories about it appeared in the Logansport Pharos Tribune on March 20 and in the Logansport Press on March 21. The Press reported it was a very fitting ceremony when the presentation was made during the morning auditorium period. The Pharos Tribune wrote the likeness of Lincoln was a "magnificent statue" that "graced the main corridor of the building, facing the Broadway entrance." Composed of marble-colored substance of plaster combination, its foundation measured 36 by 30 inches and the height from its base to the top was seven feet, six inches. The sum of $150 was spent by the history classes when they purchased the statue from the P.P. Caprosis Studio of Boston, MA. To buy the piece of art, the history students had several money-making projects. They earned money through the play given in the auditorium on February 2, 1923, entitled The Importance of Being Earnest and by selling Eskimo Pies during the basketball season. 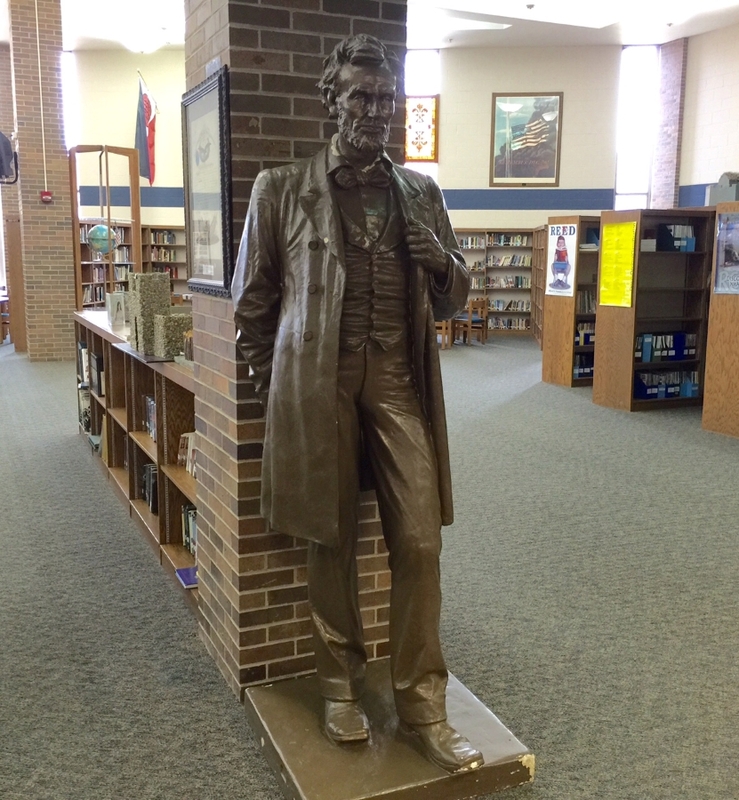 Now, 95 years later, he still stands tall and proud in the library at LHS.